IDF soldiers open fire at three Palestinian Arab suspects along the border fence. A pipe bomb was thrown overnight Thursday towards IDF soldiers in the Rafah area in the southern Gaza Strip. There were no injuries among the soldiers. Fire was opened towards three Palestinian Arab suspects who were identified as they crawled towards the security fence. It is unknown if they were injured by the gunfire. The incident took place less than a day after IDF troops uncovered an explosive device placed by Gazan terrorists adjacent to the security fence in southern Gaza. IDF troops disposed of the explosive device and thwarted the attempted attack against IDF soldiers. No injuries were reported and no damage was caused. 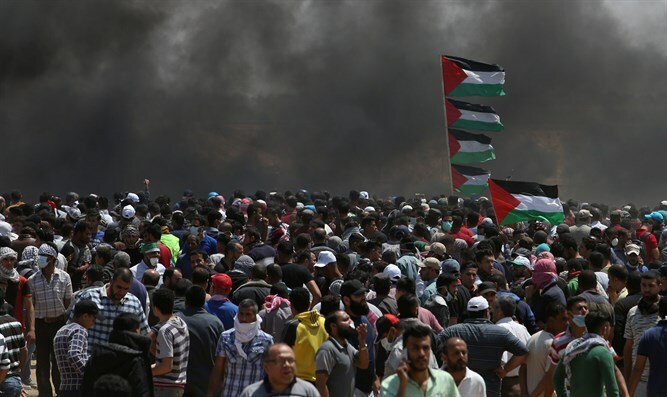 "The placement of the explosive device by the terrorist squad serves as additional proof that Hamas seeks to preserve the friction near the security fence and to harm IDF soldiers, while deliberately using Gazan civilians as human shields and as a cover for violent attacks," the source emphasized. "The IDF is ready for a wide range of scenarios and will operate with determination against ongoing terror attempts against IDF soldiers and security infrastructure."